United Way of Miami County is seeking nominees for its "Pillar Award" through October 1st, 2018. Recipients "must show exemplary personal character, professional integrity and a sense of honorable service; (have) helped to develop a strong community though promotion of family, community and church in MIam County; and (have) shown behavior that is courteous, kind, lawful, moral and ethical and has helped to create a better quality fo life within the community," according to the release. the award presentation will be made during the Chamber's Annual Dinner on October 25, 2018. 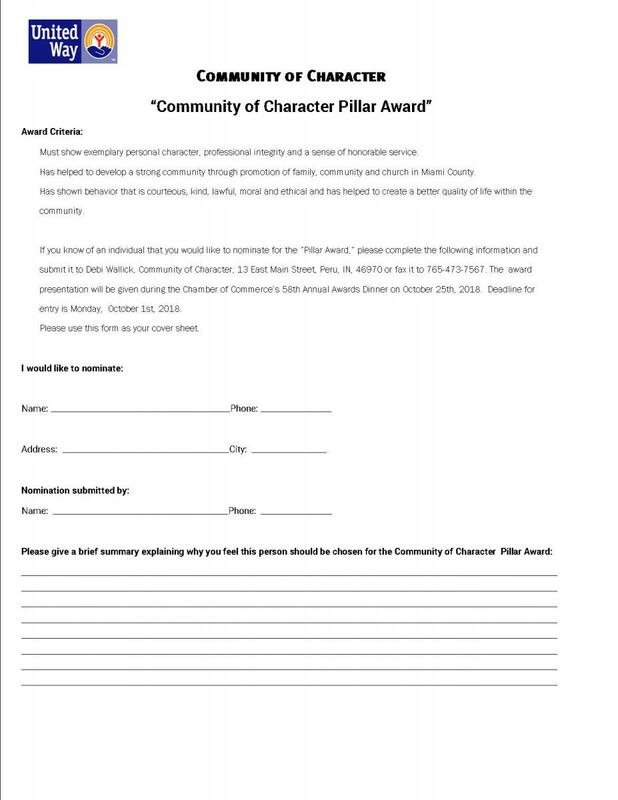 Nominations forms can be submitted to Debi Wallick, Community of Character, 13 E. Main St., Peru, IN. For more information, call 765-473-4240.